It is time for a new Anything Goes themed challenge at Crafting From The Heart. This week we have Julia Spiri as our sponsor and for my graduation card I chose an image from Fashion in Paris set. Image is colored with ProMarkers and corners are 'rounded' with a Fiskars punch (also used for 'rounding' some of the dp corners). Designer paper is a digital one from Digi Dewi. I wanted to use some kind of large flower as an eye-catcher and because I did not have any bought ones that I liked, I decided to make my own. Pedals are cut with a Punch Bunch punch and the material is recycled paint samples in three different colors. Pedals are shaped with a Fiskars tool. Shiny center piece I found from my stashed random embellies' box. Swirl is cut with a Die-namics die, cockade is a peel-off and dark purple flat-back pearls are from stashes. On aika uuden Mitä vain -teemalla varustetun Crafting From The Heart -haasteen. Tällä viikolla sponsorinamme toimii Julia Spiri ja korttiini valitsin kuvan Fashion in Paris setistä. Kuvan väritin promarkereilla ja kulman pyöristin Fiskarsin kahvaleikkurilla (jota käytin myös pyöristämään muutaman kulman kuviopaperista). Digikuviopaperi on Digi Dewin tuotantoa. Halusin korttiin jonkinlaisen ison kukkasen ja koska ostetuista ei löytynyt passelia, päätin tehdä sellaisen itse. Terälehdet on leikattu Punch Bunchin kuvioleikkurilla kierrätetyistä Tikkurilan värilastuista (kolme eriväristä lastua) ja muotoiltu Fiskarsin pallopäätyökalulla. Kimalteleva keskusta löytyi sekalaisten koristeiden purnukasta. Kiekura on leikattu Die-namicsin stanssilla, lyyra on tarra-arkista ja tummanvioletit puolihelmet kätköistä. Smashing looking card, great image. Thanks for joining my digital challenge over at Passion for Promarkers this week. Thanks for playing in the challenge at Eureks Stamps this week! This is beautiful! I love her classy dress and the colors! Perfect for a formal Graduation! Thanks for entering! Scrappy hugs! Very feminine card. Just adorable. thank you for participating in the Eureka Stamp Challenge: feminine cards/ Mother's Day cards. Good luck. Beautiful card! Thanks for entering at Connie Can Crop's monthly challenge! What a beautiful card. Love the vibrant colors. Thanks for joining us at NSHK. 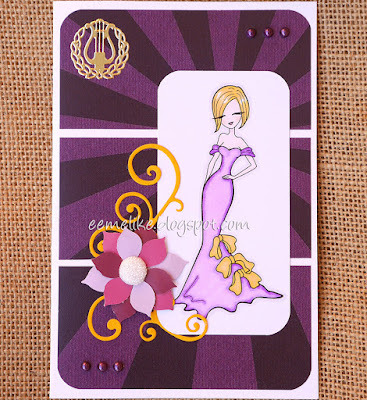 What a classy card...such a beautiful dress and the colors are wonderful. Thank you for joining us at Connie Can Crop's monthly challenge, Dads & Grads. Good luck! Thank you so much for playing along with us at Noor! Design UK challenge! xoxo t.
Thank you soo much for taking part in our "make your own embellishments” challenge over at Come and Get it.